Beautiful Incentives: FREE Starbucks blonde roast Coffee! 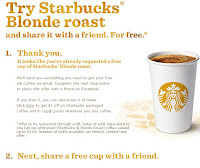 FREE Starbucks blonde roast Coffee! Free Blonde roast coffee for you and you can share one with a friend! This offer won't last long so hurry!